Chinese New Year is the most important traditional holiday for Chinese people. It is a time of rejoycing together with family. The celebrations take 15 days, starting from the first new moon when the moon at its darkest and finishing on the day of the full moon. The day of Chinese New Year, friends and family gather at home and wish each other “Gong Xi Fa Cai”, which means “wishing you prosperous year”. In recognition of the spirit of giving red envelopes, called “Hong Bao”, filled with money, are given by the older members of the family to the younger generation. Most people wear new clothes to celebrate the new beginning, mostly red which is a festive color. Days leading up to the New Year celebrations the house is cleaned, and on the day of new year the brooms are carefully put away as it is considered as sweeping away all the good luck. People gather and watching the attractions called “Wu Long Wu Shi” where lions and dragons dance on the street to celebrate the festive. This year Chinese New Year falls on the 31st of January. 2014 is the year of the horse, which is the symbol of speedy success. It is predicted to be a good year for business and for people. As it is celebrated in countries with high chinese population, Indonesia is one of the countries in South-East Asia where the Chinese New Year is a public holiday. 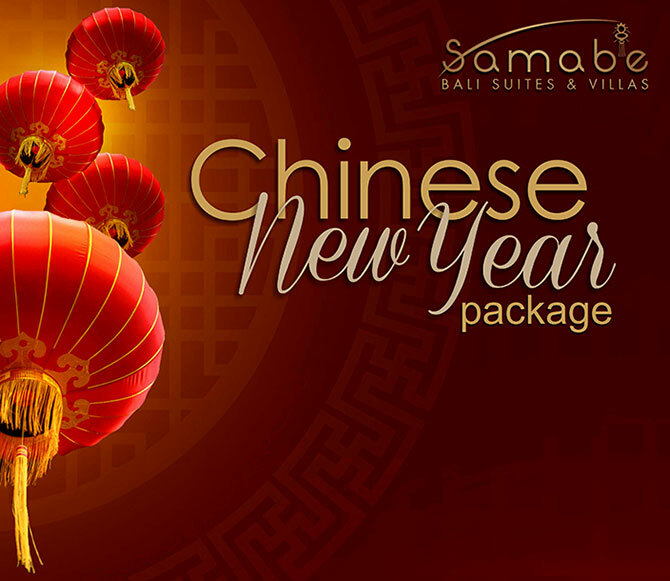 To help our guests enjoy the festivities Samabe has introduced a special Chinese New Year offer. As part of the package you will receive your own “Hong Bao” with a discount voucher for any spa treatment at Galangal Spa.